Don't be surprised by the url of the website. 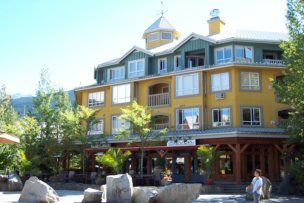 it is one of my sites and I am using a few pages of it to advertise this Whistler 2 bedroom timeshare sale as well as a Whistler Studio Timeshare we are selling. A Whistler timeshare is a valuable vacation asset. A lot of people think of Whistler as a winter destination - and it is a wonderful one. But it is also a spring, summer and fall destination. With year-round lifts and gondolas to the alpine you have easy access to alpine walks, hikes, serious hikes and backpacking once the snow melts. And at the lower elevations you have excellent shopping and village strolls for the less athletically inclined. If mountain biking is your thrill there are tons of amazing rides from novice to expert. Or is it ziplining for you? Hikers have lots of choices also. Golf turns your crank? There are 4 beautiful tournament level courses nestled in the montains. You can see pictures of these and other activities on another page. Just click here. Our 2 bedroom timeshare is located on this pedestrian street. 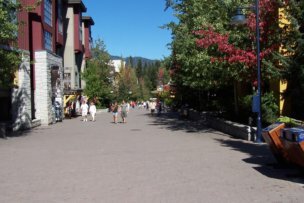 While still in the heart of Whistler Village, it is in a quieter part. 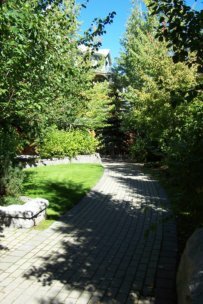 There are peaceful paths nearby for wandering just before bed or when you awake in the morning. A small stream and pools for idle reflection, or reading in the sun are a few steps away. 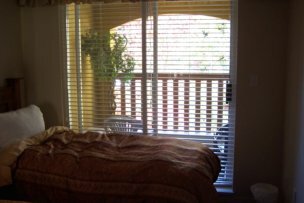 This entrance leads to the elevator or stairs leading to a beautiful 2 bedroom apartment. It is located in this modern, well maintained building. The second bedroom has a large queen bed and is functional in layout. 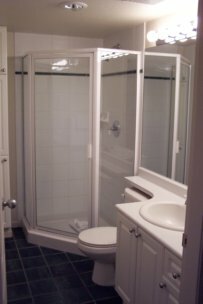 The second bathroom has a large stall shower as well as toilet and sink. The master bedroom has a king bed and is functionally laid out. The balcony is a real bonus. Imagine coffee and croissants on a quiet morning, looking at Whistler Mountain and planning a gondola ride to the top. 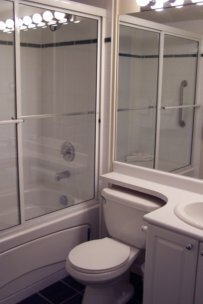 The master bath has everything you need and want. 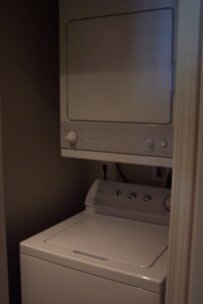 The unit has a washer and dryer, a real bonus since you don't have to leave the unit and it doesn't cost you anything. The open plan, incorporating kitchen, dining and living rooms, allows everyone to be in the action, enjoying the views, the natural light, the TV or the stereo system. One of the views from the apartment. Or how about this wonderful vista of Whistler Mountain? So if you'd like a September week Whistler 2 bedroom timeshare that sleeps a maximum of 6 (4 private) send us an e-mail by clicking here. 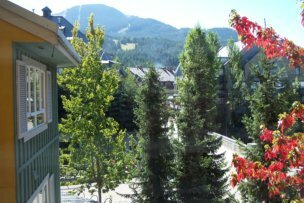 Whistler studio timeshare are so great, why are you selling them"? The answer is that after a number of years focusing on sailing in our 70 foot sailboat, we have shifted to a small motorhome. 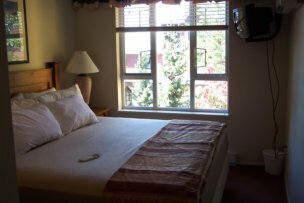 Being in the gentle state of retirement we will be away a lot more in the spring, summer and fall so it makes a lot of sense to sell our timeshares. When we want to go to Whistler for the spring, summer and fall activities we love we will drive up and camp nearby. So for us it just makes good sense to sell. 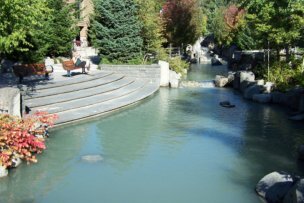 I have already talked a bit about the great activities at Whistler in the spring, summer and fall. You can find out more by clicking here. So that`s already a bunch of reasons to buy a week at Whistler. In short, it is a great place to be. The other major reason is that because Whistler is in such great demand it is a real advantage to have a timeshare there when you want to use it in the RCI system. to get a week in another of the over 6600 RCI resorts on 5 continents. With RCI you can also get "RCI Extra Vacations" which allow you to extend your vacation at a resort or another nearby at really discounted prices. Whistler is always a gold week, which gives you priority over owners whose timeshares are in less highly rated resorts. 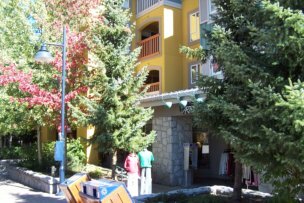 This 2 bedroom timeshare in the heart of Whistler Village is offered for sale at an excellent price because by selling direct we do not have to eat any commission that would go to a timeshare salesperson. You would be buying registered title to a fee simple ownership of a floating week (in weeks 36-40 which typically fall somewhere between 9 September and 7 October in unit 409 of Town Plaza. After you purchase the unit, if you want to book it for your own use, you simply call Whiski Jack Resort up to 10 months in advance and book the floating week you want. If you want to travel elsewhere, you first book any one of the floating weeks, and then call RCI and deposit that week with them. You then have up to 3 years to book a week at another RCI or RCI affiliated resort. Some of these other resorts are spectacular. We have used our Whistler timeshares to book in Hawaii to lengthen our stay there beyond the weeks we own in Hawaii. Last year we booked in an incredible resort in Waikoloa Beach on the Big Island. It was truly fantastic! If you want to pursue this the price of the unit is $6,000 Canadian. You can reach us by e-mail by clicking here. We can then correspond by e-mail or make arrangements to talk by phone. 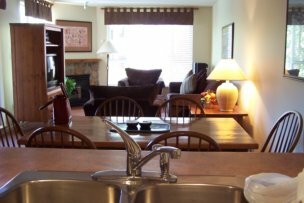 If you want to know about our Whistler STUDIO timeshare, which is also for sale, please click here. 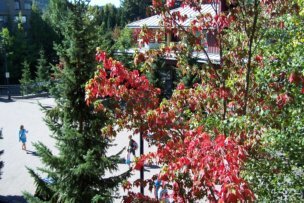 And for the Whistler summer, fall and spring activities click here.